For the past ten years, I have chosen a word for the year although sometimes it chose me. My first word of the year was found on a beaten up old RV... across the back was splashed the word: JUBILATION. The very sound of the word lifted my spirit and I knew I wanted to spend time with it. It began a tradition that has become very important to me. Some of the words in past years were familiar and some were completely new to me. 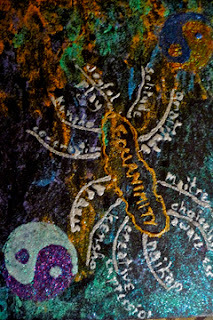 Annual words include "chrysalis," "querencia" (a quiet place of safety where we gather our power for the coming challenge), "abbondonza" (an Italian word that made me think of dancing with abundance), and "autopoiesis" (life continually re-creating itself and its parts while organizing itself in relationship to its surroundings). Each year about this time, I open myself up to the words that have come my way during the year ... kept on the last page of my annual journal so I can find them easily ... and pick the one that calls to me. This word goes on the cover of the journal in gaudy and colorful glitter glue with the word and the year on the spine for quick reference once they're shelved. I start a new journal every year even if the previous year's journal wasn't filled. It's a metaphorical new start. During this end of the year time, I also reflect on this year's word and review the year's journey. My journals are not diaries ... there's very little "what's going on and what I'm thinking and feeling" type of stuff but rather lots of mindmaps, lists, ideas, images, quotes and anything else that captures my attention. Flipping through them is a little like time travel on fast forward. This past year had two words ... "beauty" and "equanimity" (mental calmness, composure, and evenness of temper, esp. in a difficult situation) and both were perfect talismen for a chaotic year. For the first time, the cover of my journal was actually a mindmap. Since I knew it was going to be a transition year, I mapped the qualities that I thought would help me maintain equanimity: gratitude, solitude, joyful play, kensho (seeing one's true self/nature. Seeing the non duality of subject and object); co-creation, praxis (spiritual practice), creative expression, naikan (gratitude reflection practice) and maitre (Sanscrit for loving kindness toward self). While I wouldn't say this past year reflected perfect equanimity, I think the focus on maintaining calmness helped me deal with the changes of the year. This year there are again two words calling me: "hallelujah" which seems to be a call to a constant state of gratitude ("nothing on my tongue but hallelujah") and "temenos" (he circle in which magic of the soul can happen). I may choose them both. Amarantine - everlasting. Imaginary flower that never fades. Amaranth -- shade of deep purple - red. Abbey of the Arts also has a richly poetic post on the process of choosing a word for the year. If you want to join this tradition, I highly recommend this post. Great post. Your words are wonderful and so full of meaning. I bet your journals are fascinating. Vision Collage - You're Invited!